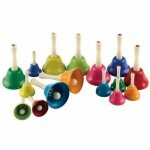 A set of 8 music bells which play notes (1-C, 2-D, 3-E, 4-F, 5-G, 6-A and 8-C) They are colourful and playful - an ideal fun activity whilst learning early stages of musical appreciation. Each bell is 140mm high, varies in colour and is identified by a note-labelled handle. ..